Baby monitors are important for parents of newborns since they allow you to monitor your baby without being in the same room. A good monitor also helps you get a good night’s sleep because it will allow you to sleep with confidence knowing that if your baby cries it will alert you. There are two primary choices – audio only or video and sound monitors. There is also movement detection systems that detect a lack of movement in a crib which could indicate a more serious problem. While more and different types of features keep becoming available on monitors, the most basic functions you need are the most important which includes sound quality (and video quality if a video monitor), range, ease of use, and battery life. In recent years there have also been units introduced that work with wi-fi and smart phones, however we focused on and looked at the more traditional stand alone units that do not require wi-fi or a smart phone. Below we review the best baby monitors. We selected the Infant Optics DXR-8 as the best video baby monitor. Selling for about $170, the DXR-8 is the best selling baby monitor on Amazon. The camera uses interchangeable lens technology – three separate lenses to get the best viewing angle (however, the wide-angle lens is sold separately), remote pan/tilt/zoom functions, and invisible IR night vision. The monitor provides real time video on its bright 3.5 inch LCD display with a battery that can last 10 hours in power-saving mode (audio only) and 6 hours with the screen constantly on. It charges via a micro USB cable. Other features include plug-and-play functionality with easy to use interface, secure 2.4Ghz FHSS wireless transmission, remote temperature display, two-way talk, and expandable up to 4 cameras. Users praise the range of the DXR-8 and the video quality including night vision is quite good, but maybe not great. However, the sound quality is below average. So if you are looking for a video monitor with long battery life then the Infant Optics DXR-8 is an excellent choice. We could have just as easily chosen the $229 Samsung BrightView SEW-3043W as the best video baby monitor, however, two main negatives knocked it down to number two on our list. First the range, while it claims to be 900 feet without obstacles, it seems to be much less for some users once walls and doors are included. Secondly, the battery life is only a few hours in video mode and about 5 hours in VOX mode which is not bad, but is much less than the DXR-8 in audio only mode. The positives start with the 720p HD pan/tilt/zoom camera and the large 5″ touch screen monitor with excellent video quality. Other features include 4 pre-programmed lullabies, two-way talk, voice activated mode (VOX), and night vision up to 16 feet. The VOX works great on this Samsung device and the sound quality is really good too. Overall we recommend the Samsung SEW-3043W for buyers who want a video monitor and where baby’s room or the camera will be close to the monitor. We chose the Philips SCD570/10 Avent as the best audio baby monitor which costs $99. With a range of 50 meters (about 160 feet) indoors it transmits wirelessly through DECT technology which ensures a secure, zero-interference connection. 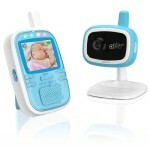 Other features include temperature sensor, night light and lullabies, sound activated lights, and talk back function. Overall we recommend the Philips Avent SCD570/10 for anyone looking for an audio monitor since it is extremely reliable, has a long range, and provides all the features you could want besides video. If you are looking for an audio unit with a baby movement monitor then we recommend the Angelcare Baby Movement and Sound Monitor. This audio/movement monitor features overwhelmingly positive user reviews, including being on of highest rated baby monitors on Amazon, and will cost you about $90. It has the best tested range in its class and is resistant to interference. It offers continuous or voice-activated sound transmission and will sound an alarm when no movement is detected for 20 seconds. About the only negatives for this unit are that it is a bit more difficult to set up and use than some other models, plus there is no talk-to-baby feature. The best video baby monitor under $100 is the Infant Optics DXR-5+ which sells for $99.99. This second generation unit uses 2.4 GHz FHSS digital transmission which does not interfere as much with wi-fi. The portable monitor has a 2.4″ LCD display that provides decent video, but not great. Other features include two-way talk, VOX mode, audio-only mode, sound activated LEDs, and night vision infrared lights. We recommend the Infant Optics DXR-5+ for anyone looking for a cheap video baby monitor. The Angelcare AC1100 Baby Video Sound and Movement Baby Monitor System is a good choice for a unit that combines a quality video, sound, and a movement monitor in a single system. Costing about $150, the AC1100 includes a under-the-mattress movement sensor pad, a 2.75″ color touch screen, and day and night vision camera. Other features include 2.4 GHz digital transmission, two-way communication, and temperature sensor. While the audio quality is decent the overall the video quality is pretty poor compared to the newer top end models. We only recommend this Angelcare model if you are looking for a movement monitor in addition to a video and sound monitor. 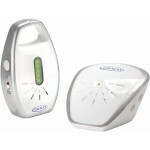 The best audio baby monitor under $50 is the Graco Secure Coverage 1773028 which sells for about $45. It operates on the 900 MHz frequency so there is no interference from microwaves or telephones. The parental unit features a belt clip, sound lights, vibration alert, and a rechargeable battery. The nursery unit works using a standard plug-in, but also includes a battery backup of 3 AAA batteries. While it has pretty good range, this Graco model does not have a lot of extra features. Therefore we only recommend it for anyone who just needs a cheap, basic audio monitor – especially if you want a vibration alert which is great at getting your attention while you are doing chores. 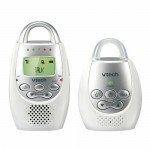 The VTech DM221 Safe & Sound Digital Audio Monitor is our pick for the best cheap baby monitor. At under $36, this Vtech audio monitor offers solid performance at an amazing price. It uses DECT 6.0 digital technology for clear sound transmission. With the baby-talk feature you can communicate from the parent unit to the baby unit from another room, plus it has a 5-level sound indicator and a vibrating sound alert function. The biggest downside to this model is the range. It is the poorest of all the units on this list. However, if you are looking for a cheap audio monitor then the VTech DM221 is a good choice for you.